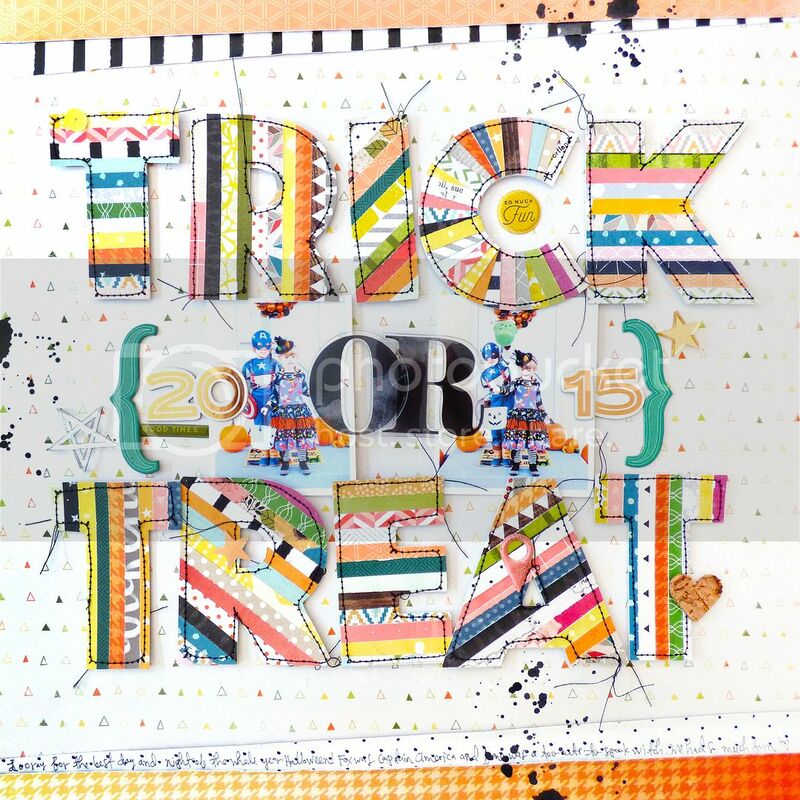 JOURNALING SAYS: Hooray for the best day and night of the whole year: Halloween! Fox was Captain America and Jane was a too-cute-to-spook with. We had so much fun! 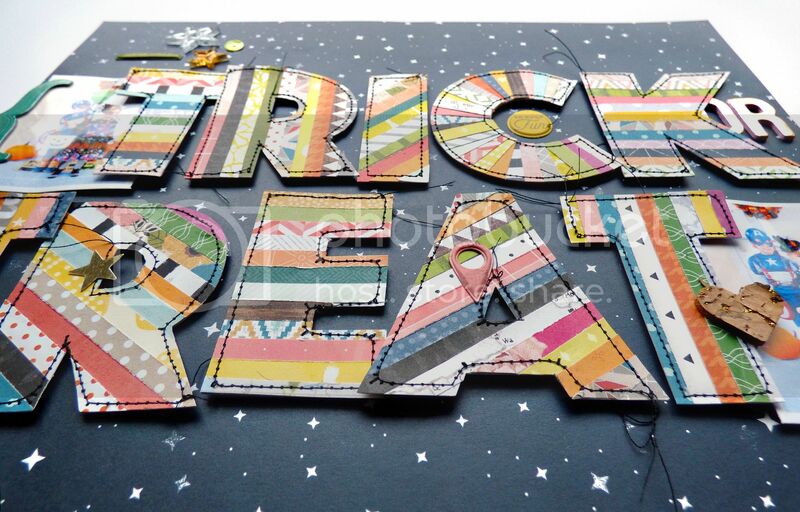 HOW TO: Die cut large "TRICK" and "TREAT" letters (doesn't matter which color of cardstock), cover them with patterned paper strips, then machine stitch around them. 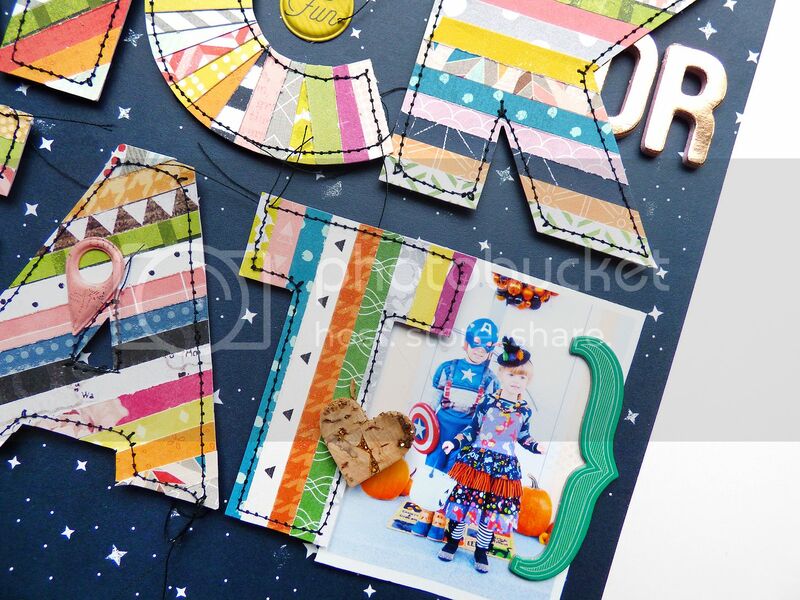 Adhere the letters to a dark patterned paper background using foam squares with "OR" Thickers between. Tuck photos under the left and right sides and frame with bracket Thickers. 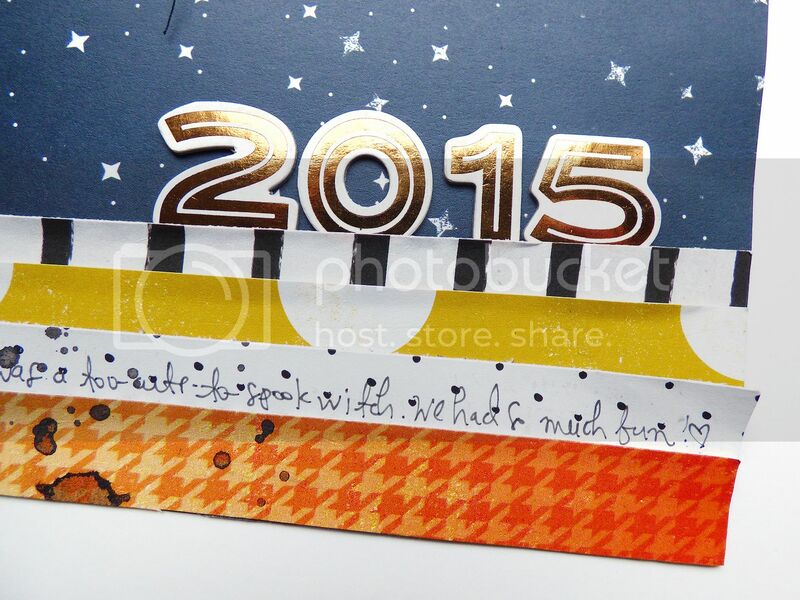 Adhere patterned paper wedges across the bottom and journal across one of them. Add the year in Thickers. I actually made this version first but scrapped it (lol, "scrapped") because it seemed too busy, but now I can't decide which one I like better... What do you think? T-minus 3 days until HALLOWEEN!! Love love love love this! LOVING how you did that title!!!!! What are the kids going to be this year??? Brookie is ridiculously TALL for her age, so we had to buy her an 'adult' costume -- which as you know, woman's costume can be a little... ummmm inappropriate for a 10 year old -- so we try and still make it cute for her! They call her costume "The Dark Mad Hatter" .... yet there is bunny ears and pocket watch -- so that's the White Rabbit from Alice in Wonderland -- so I am gonna have to work on that one with her! LOL!!! wow these are AMAZING--LOOOOVE them SO much!! Wow! I can't even begin to tell you how fabulous both of these layouts are. 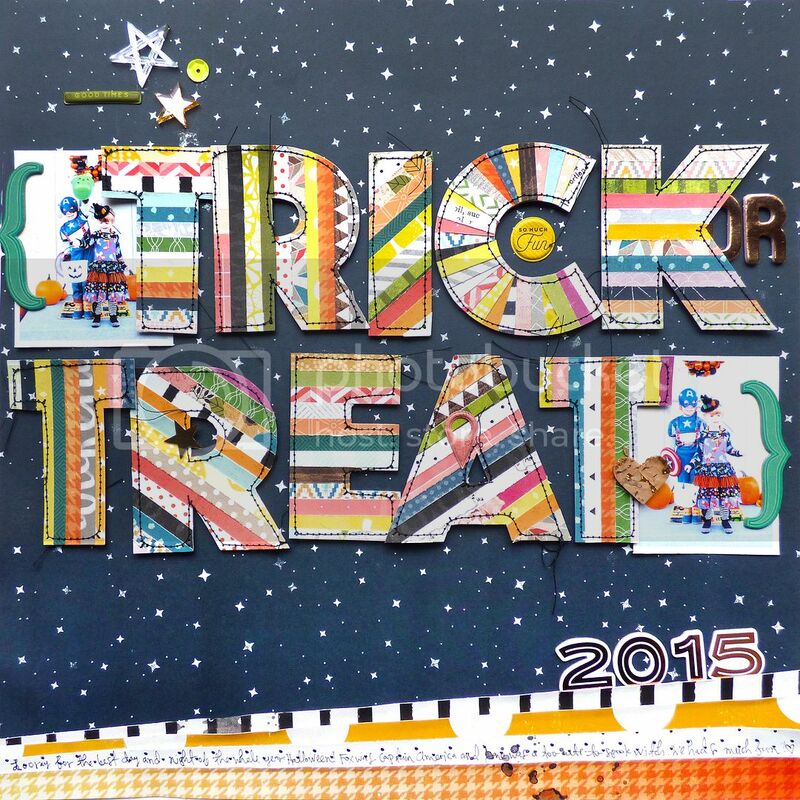 Love all the color, quilted letters, inkiness, acetate letters and the overall design. Especially love the dark starry background contrast.